The fig tree is one of the symbols of Israel in the Hebrew Scriptures (Hos. 9:10, Jer. 24:1-10, and Joel 1:7). 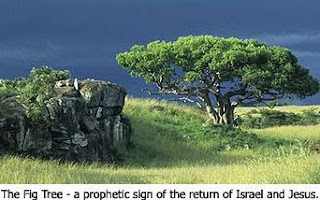 Jesus used a real fig tree to point out the future of Israel. His prophecy is contained in the Fig Tree Lesson in Matthew 24:32-35, which He presented in His Olivet Discourse. The day before He delivered this speech, He had put a curse on a barren fig tree, causing it to wither (Matt. 21:18-22). This was a symbolic prophecy that God would soon pour out His wrath upon the Jewish people because of their spiritual barrenness in rejecting His Son. The next day Jesus reminded His disciples of the fig tree. He said to watch for it to bloom again. In other words, He said watch for the rebirth of Israel. He indicated that when the fig tree blooms again, He would be at the gates of Heaven, ready to return (Matt. 24:33). "Truly I say to you, this generation will not pass away until all these things take place" (Matt. 24:34). What generation? The generation that sees the fig tree blossom. Jesus singled out this event as the one that would signal His soon return. Well, the re-establishment of the state of Israel occurred on May 14, 1948, so we are that generation! The fig tree has blossomed. Jesus is at the gates.